This is a unique cement additive having judicious combination of various selective polymers which work in different manner. Makes concrete more cohesive, hence protects steel better against corrosion. 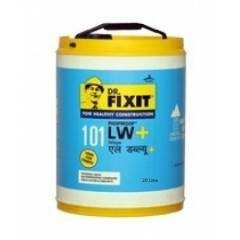 Increases durability by improving waterproofing of concrete. Waterproofs by filling pores and cutting capillaries. Improved dispersion mechanism leading to water reduction. Increases cohesive strength of the mix. It makes concrete cohesive and prevents segregation. Provides excellent heat insulation & energy savings. Recommended for commercial buildings, warehouses, factories, metal tanks, water tanks. amazing and worthy product in protecting steel much better against corrision. I purchased it while renovating my home, Totally satisfied with the purchase. Superfast delivery services! Delivered dr. fixit pidiproof to my store in few days. Moglix services are seconds to none !